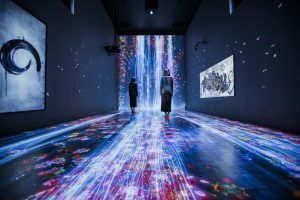 A face to face chat with teamLab is a difficult thing as they consist of over 500 artists, scientists and technologists- so we decided to chat digitally via email below teamLab talk about their work, what and who they are and their new show at PACELondon that opened to amazing reviews last week. Last time I saw teamLab was at START in 2015, what have you been up to? And how has teamLab developed? 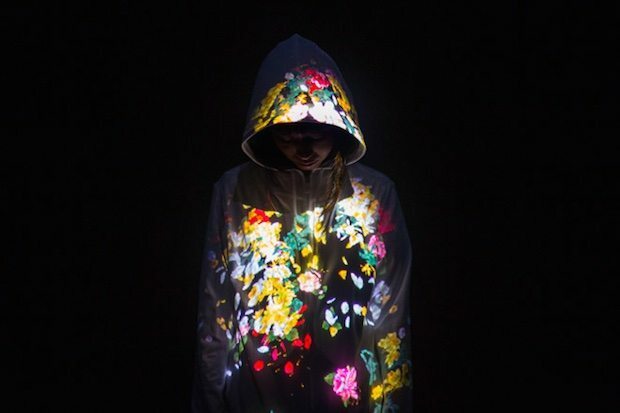 For people who don’t know, can you tell us a bit about what teamLab is? 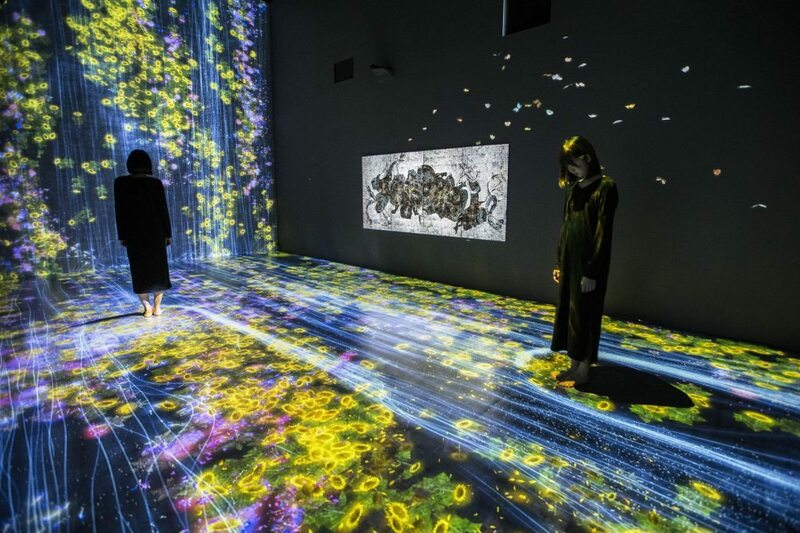 teamLab is a collective, interdisciplinary creative group that brings together professionals from various fields of practice in the digital society: artists, programmers, engineers, CG animators, mathematicians, architects, web and print graphic designers and editors. Referring to themselves as “ultratechnologists,” the group aims to go beyond the boundaries between art, science, technology and creativity, through co-creative activities. 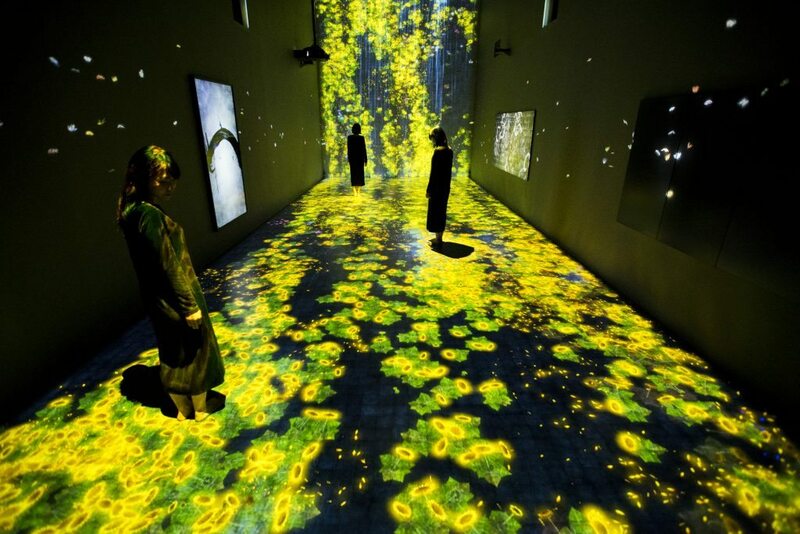 teamLab is represented by Pace Gallery in NY, Ikkan Art Gallery in Singapore and Martin Browne Contemporary in Sydney. We called ourselves as Ultratechnologist, it means a person who devotes to creation with high expertise, such as engineers, programmers, 3DCG animators and architects. We are becoming one by going beyond the boundaries of the specialized fields. They will be united by working together and thinking while creating. There is no single artist in the project. The project consists of different technologists with different expertise. It is because teamLab as a group is an artist. Also, we prefer the scientific approach. For example, we explore finding the logical constructs of ancient Japanese or Eastern Asian spatial recognition, and 2D-tizing the world made on three dimensions based on its logical structure. Also, we are exploring what logical features of what spatial theory is and expressing the process of exploration. How did you start working with Pace? Our art world debut finally came in 2011 at the Kaikai Kiki gallery in Taipei thanks to the artist Takashi Murakami. Since then, we have gained opportunities in cosmopolitan cities such as Singapore. Finally, our works have been exhibited in the Pace Gallery in New York from 2014 onward. Even within Japan, our efforts to publicize and exhibit our art ourselves have borne fruit and lead to drastic changes in our situation. 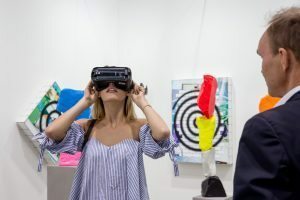 We believe that new, digital art not only stretches the possibilities of art, but will change the status quo of museum and gallery spaces, how people appreciate art, and how the art market should exist. By collaborating with Pace Gallery, possibilities for proactively experimenting and trying out things have been opened not just for the artwork itself, but for how spaces for art should be, how one might approach those who appreciate it, and the status of the market. What will be showing at Pace London? 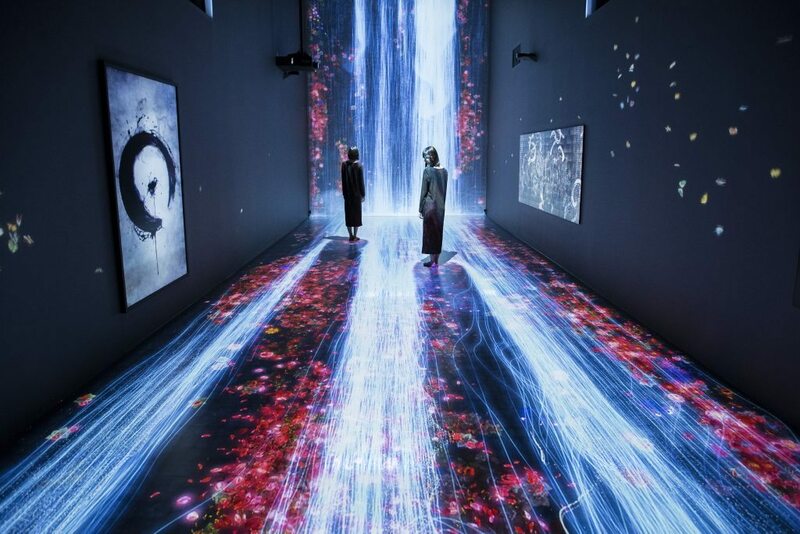 For this exhibition, as we named “teamLab: Transcending Boundaries”, we intended to extend this concept and transcend boundaries not only between artworks and viewers, but also between artworks, uniting a group of individual pieces into one immersive experience. In the mind, there are no boundaries between ideas and concepts, they are inherently ambiguous and influence and interact with each other. In order for ideas and concepts to be expressed in the real world it is necessary to have a physical material substance through which they are mediated. Boundaries are created when ideas and concepts are materialized in the real world. Within the digital domain, art is able to transcend physical and conceptual boundaries. Digital technology allows art to break free from the frame and go beyond the boundaries that separate one work from another. Elements from one work can fluidly interact with and influence elements of the other works exhibited in the same space. In this way, the boundaries between art pieces dissolve. And these are the concept of 8 artworks (a – h). Water is represented by calculating the interactions between a continuous flow of hundreds of thousands of water particles. Then, lines are drawn in space in relation to the behavior of the water particles. The accumulation of these lines expresses the waterfall. In the background, cherry blossoms bloom and scatter, the cycle of birth and death repeats. From the center a circle is born which increases in size with a constant rhythm. Depending on the circle the light and darkness of the background world changes. In Zen, ens? is a circle that has since ancient times been written with canes or sticks in midair. It is said to represent enlightenment, truth, the entirety of the universe, and equality. The circle also reflects the hearts and minds of those who view it, with its interpretation left to the individual. In the interactive work Flutter of Butterflies Beyond Borders, Ephemeral Life, butterflies are born from where people stand in the exhibition. The patterns on the butterflies’ wings transform as they fly through space. As the work progresses, the butterflies fly seamlessly into the nearby installations, eliminating the boundaries between the works. 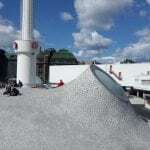 This process ultimately creates an all-encompassing interactive installation. The flight pattern of the butterflies is influenced by the state of other works, as well as the behavior of the viewers: the butterflies gather in places in other works where flowers bloom, and if a viewer touches a butterfly, it dies. The artwork is created in real time by a computer program. The images are not prerecorded or played back. The entire work continuously changes and the same state will never be repeated. The movement of waves in water is simulated in a computer-generated three-dimensional space. The water is expressed as a continuous body after calculating the interactions of hundreds of thousands of particles. 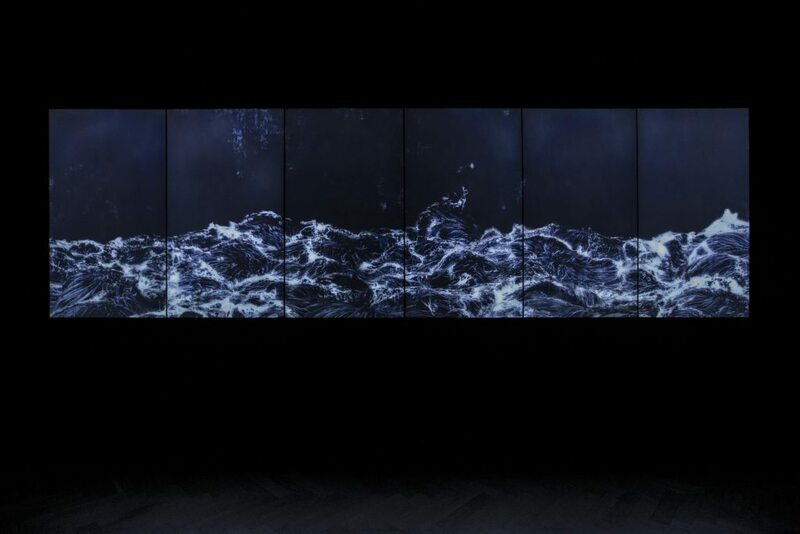 To visualize the waves, the behavior of the particles on the water was then extracted and lines were drawn in relation to the movement of the particles. 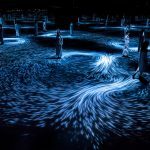 The wave created in a 3-D virtual space is then turned into an artwork in accordance with what teamLab refers to as ultrasubjective space. Without people this installation is a dark space. When people enter the room the flowers blossom on the people and before long the flowers spread out below their feet. When those flowers come close to another person they spread in that direction and connect. The flowers bud, grow, and blossom before their petals begin to wither, and eventually fade away. The cycle of growth and decay repeats itself in perpetuity. When the viewer is still, more flowers are born and simultaneously bloom. When the viewer moves the flowers begin to wither, die and fade away. This artwork is in continuous change, neither a pre-recorded animation nor on loop, the work is rendered in real time by a computer program. The interaction between the viewer and the installation causes continuous change in the artwork; previous visual states can never be replicated, and will never reoccur. What’s up next for you after your London show? Garden Necklace YOKOHAMA 2017, March 25th (Saturday) – June 4th (Sunday), Hyoen 2017 (Kabuki Iceskating show in Tokyo) and GINZA SIX Project. TIMED ENTRY – YOU NEED TO BOOK HERE. This entry was posted in INTERVIEWS and tagged teamLab. Bookmark the permalink. ← Leading International artists use materials recovered from The Glasgow School of Art fire to create new works for auction.